Line cookie sheet with foil and place chicken wings on foil. Salt and pepper and bake at 425 degrees F for 25 minutes. 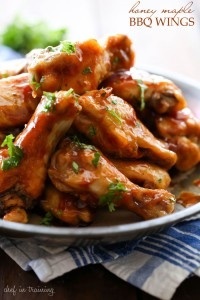 While chicken is cooking, mix together honey, mustard, maple syrup, barbecue sauce, cayenne pepper and garlic powder in a small mixing bowl. After the chicken has cooked 25 minutes, remove from oven and drain off grease. Pour sauce over chicken and coat well. Return to the oven for another 7 minutes. I garnished mine with some chopped parsley.